Lower Hutt (Māori: Awakairangi) is a city in the Wellington Region of the North Island of New Zealand. Administered by the Hutt City Council, it is one of the four cities that constitute the Wellington metropolitan area. Lower Hutt from the air, looking eastwards in March 2009. It is New Zealand's seventh most populous city, with a population of 105,900. The total area administered by the Council is 377 km2 (146 sq mi) around the lower half of the Hutt Valley and along the eastern shores of Wellington Harbour, of which 135 km2 (52 sq mi) is urban. It is separated from the city of Wellington by the harbour, and from Upper Hutt by the Taita Gorge. Though the Hutt City Council administers the city, neither the New Zealand Geographic Board nor the Local Government Act recognises the name "Hutt City". This name has led to confusion, as Upper Hutt is administered by a separate city council, the Upper Hutt City Council, which objects to the name "Hutt City". Before European settlement, thick forest covered most of the Hutt Valley, with areas of marshland close to the river's mouth. Māori inhabited the shoreline, with a pa at each end of Petone beach. Māori welcomed the arrival of the New Zealand Company ship Tory in 1839, and William Wakefield (the company's agent) negotiated with local chiefs to allow settlement. The first immigrant ship, the Aurora, arrived on 22 January 1840, an event still commemorated every year on the Monday closest as Wellington's Anniversary Day. A settlement, Britannia, grew up close to the mouth of the Hutt River, and settlers set up New Zealand's first newspaper and bank. Christ Church, Taita, built in 1853 – the oldest extant church in the Wellington region. Within weeks of settlement the Hutt River flooded, and in March 1840 the majority of Britannia settlers decided to move to Thorndon, (as of 2013[update] in the heart of Wellington city), though some settlers remained at the north end of the harbour. In the 1840s an area on the west bank of the Hutt River formed the village then known as Aglionby. In 1846 conflict arose between European settlers and Māori, which led to skirmishes in the Hutt Valley Campaign. The 1855 Wairarapa earthquake (in the range of magnitude 8.1 to 8.3) raised part of the lower valley, allowing reclamation of land from swamp. The fault escarpment from the earthquake is still visible, notably at Hutt Central School. On New Year's Day 1859 the first permanent lighthouse to be built in New Zealand was lit at Pencarrow Head. New Zealand's only female lighthouse keeper, Mary Jane Bennett, became the inaugural operator of the lighthouse. The railway line from central Wellington reached Lower Hutt station (subsequently Western Hutt) in April 1874, with the line running north up the west side of the Hutt River to Silverstream opening two years later. Before the Second World War of 1939–1945, urban settlement in the lower Hutt Valley concentrated mainly on Petone, central Lower Hutt and Eastbourne, with a total population of 30,000. In 1927 the Public Works Department completed the construction of a branch railway line to Waterloo on the east side of the river; the route diverging from the main line between Lower Hutt and Petone. Two years later the railway workshops moved from Petone to a new larger site off the new branch at Woburn. In the late 1940s new suburbs of state housing developed along the eastern side of the Hutt Valley, from Waiwhetu to Taita, to alleviate nationwide housing shortages and to cater for the booming population. Between 1946 and 1954 the railway line from Waterloo extended through these new suburbs to Haywards, becoming the main line in 1954 when the existing main line between Haywards and Melling closed. By the end of the 1950s, Lower Hutt had a population of 80,000. The Hutt City Council comprises a mayor and 12 councillors. Ray Wallace first won election as Lower Hutt mayor in 2010, succeeding David Ogden. The city's six electoral wards (Northern, Western, Central, Eastern, Harbour and Wainuiomata) each elect two councillors. Wainuiomata Community Board: Richard Sinnott (Independent – Chair), Gabriel Tupou (Independent – Deputy Chair), Jodie Winterburn (Independent), Keri Brown (Labour), Terry Stallworth (Independent), Sisi Tuala-Le'afa (Independent), councilors Campbell Barry and Josh Briggs. Eastbourne Community Board: Virginia Horrocks (Independent – Chair), Murray Gibbons (Independent – Deputy Chair), Robert Ashe (Green Party), Liz Knight (Independent), Anna Sutherland (Independent), councilors Michael Lulich and Tui Lewis. Petone Community Board: Pam Hanna (Chair – Independent), Mike Fisher (Deputy Chair – Independent), Mason Branch (Independent), Brady Dyer (Independent), Peter Foaese (Independent), Karen Yung (Independent), councilors Michael Lulich and Tui Lewis. Neighbouring councils are Wellington City Council (adjoining to the west), Porirua City Council to the north, Upper Hutt City Council to the north-east and South Wairarapa District Council to the east. The boundaries of the Lower Hutt city local body have evolved from a series of amalgamations and boundary changes over the years. The Hutt County Council, established in 1877, covered the region from Wellington's south coast up to Waikanae, excluding the Wellington City Council area. As the region grew, urban parts of the Hutt County became autonomous boroughs: Petone in 1888, Lower Hutt in 1891, Eastbourne in 1906, Johnsonville in 1908, Upper Hutt in 1908, Porirua in 1962 and Kapiti in 1974. The area of Lower Hutt is covered by two general electorates (Hutt South and Rimutaka) and by two Māori electorates (Ikaroa-Rāwhiti in the north and Te Tai Tonga in the south). The city centres on the lower (southern) valley of the Hutt River, to the northeast of the city of Wellington. The valley widens into a delta as the river nears its mouth, so the central urban area of the city forms a triangle with its longest side along the shoreline. In the upper reaches of the city the Western and Eastern Hutt Hills become closer, culminating in the Taita Gorge at the northern end of Lower Hutt, separating the city from neighbouring Upper Hutt. Lower Hutt's boundaries include the islands in Wellington Harbour, the largest of which, Matiu/Somes Island, is commonly referred to by its former name of Somes Island. Lower Hutt has a humid climate with relatively warm summers and mild winters with the occasional storm. A single major aquifer dominates the lower Hutt Valley: the Hutt River, originally named Heretaunga and as of 2016[update] known as Awakairangi / Hutt River. Awakairangi in the Maori language means "river of food from the sky". Lower Hutt occupies the lower regions of the flood plain of the river, one of the most significant features of the city. In the 20th century the Hutt River Board built stopbanks to contain the river, but the threat of flooding from heavy rainfall persists. In 1985 the river burst its banks, and since then floods have been on a smaller scale. Smaller streams and storm-water drains have also caused occasional problems when rainfall exceeds average levels. Much of the land adjacent to the river is protected[by whom?] as reserve and provides popular recreational areas, with walking and cycling trails and grassed areas at various points along both sides of the river up the Hutt Valley. With lower river levels in mid-summer, algal blooms have contributed to making slow-flowing areas anoxic. The algal blooms have been attributed[by whom?] as the cause of death of a small number of dogs swimming in the river, as well as of skin reactions in the case of swimmers. The river is crossed by seven bridges within the city, and has seen many times that number built and replaced since the 1850s. Here are listed the following suburbs of Lower Hutt City (unofficial suburbs are in italics). Lower Hutt is home to 105,900 people, of which 105,200 live in the urban area. The city's population has remained stable since the 1990s. At the 2013 Census of Population and Dwellings, 71.0 percent of Lower Hutt residents identified as of European ethnicity, 17.1 percent as Māori, 11.7 percent as Asian, 11.0 percent as Pacific Peoples, 1.1 percent as Middle Eastern/Latin American/African, and 1.6 percent as another ethnicity (mainly 'New Zealander'). 23.7 percent of Lower Hutt's population was born overseas, compared to 25.2 percent for New Zealand as a whole. Asia is the largest region of origin, accounting for 30.7 percent of the overseas-born population in Lower Hutt. Around 50.4 percent of Lower Hutt residents affiliate with Christianity and 6.7 percent affiliate with non-Christian religions, while 40.6 percent are irreligious. Catholicism is the largest Christian denomination in Lower Hutt with 16.4 percent affiliating, while Anglicanism is the second-largest with 10.8 percent affiliating. Hinduism (3.3 percent) and Buddhism (1.5 percent) are the largest non-Christian religions. Historically, Petone, Seaview and Gracefield have been the main area for industry in the Wellington region, with industries including meat processing and freezing, motor vehicle assembly, and timber processing. As business have taken advantage of global manufacturing efficiencies, much of this large scale industry has changed to smaller design-led and medium-sized industries exporting to the world. Over the past 25 years service, distribution, and consumer-oriented sectors have increased. Lower Hutt remains the main location for light industrial activity in the Wellington Region. In 2010 the lower reaches of the Waiwhetu Stream was cleaned up to remove toxins from decades of industry use. The channel was also widened to better protect against floods and native plantings and management has seen native waterlife and birds return to their habitat. Lower Hutt has one of the greatest proportion of science, technology and high value manufacturing businesses in New Zealand. Cutting edge Crown Research Institutes such as GNS Science and business accelerator Callaghan Innovation are based in Lower Hutt along with over 800 research organisations in high-end manufacturing, research and technology. The city is popular for outdoor sports, especially mountain biking, hiking, recreational walking and fishing. The central city is home to Westfield Queensgate, a large shopping centre. The Riverbank car park adjacent to the central city is home to a Saturday market. Among the filming locations for The Lord of the Rings (film series) directed by Peter Jackson, Dry Creek quarry, which dominates the hills above the suburb of Taita, became the site for a huge medieval castle built for scenes of Helm's Deep and Minas Tirith. The city is served by The Dominion Post and community newspapers. Local LPFM radio station The Cheese broadcasts in the city, and is licensed with APRA and PPNZ in New Zealand for music broadcasting rights. 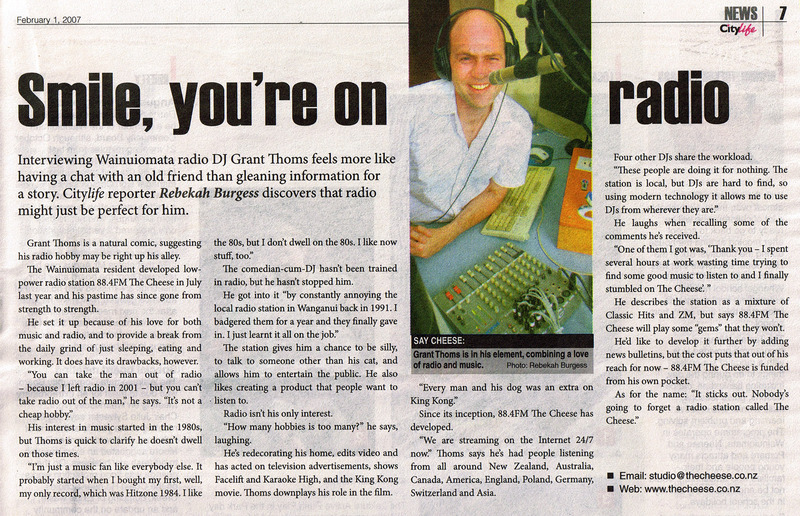 It began Saturday 1 July 2006 and its original frequency was at 88.4 FM from Wainuiomata. The station can be heard in Lower Hutt on 87.9 MHz FM with simulcasting via their official website. Subscribers to Vodafone TV can hear The Cheese on channel 417. The station broadcasts a mix of music from the 80s, 90s, recent and current hits. Julian Dennison (born 2002), child actor. Wider view of the Lower Hutt valley. This view shows Wellington in the distance on the extreme right hand side. Past the Lower Hutt CBD in the centre of the photo, and onto Avalon and Taita on the left-hand side. A panorama taken from 400 feet above the Wanuiomata hills. Wellington Harbour can be seen on the far left, with Petone and the Hutt Valley towards the middle of the image. The Wainuiomata Hill road can be seen curling around the bottom right of the image as it snakes into the suburb of Wainuiomata on the right hand side. ^ "Hutt City - About the profile areas". .id - the population experts. Retrieved 25 March 2019. ^ "Hutt City Council Forest Plan". ^ Wakefield, Edward Jerningham (1848). The Hand-book for New Zealand: Consisting of the Most Recent Information. John W. Parker. p. 103. Retrieved 5 June 2013. The main road [...] reaches the west bank of the Hutt at the spot whence [...] the river bends gradually towards the eastern side of the valley. [...] On the same bank of the river, about half a mile lower down, is the village of Aglionby, which contains an excellent Tavern, with good stabling and other accommodation; a small building used as a Church and a school, a blacksmith's forge, and several shops, one or two good farm-houses, and numerous labourers' cottages. ^ Easther, John (1991). The Hutt River = Te-Awa-kai-rangi : a modern history, 1840–1990. Wellington Regional Council. Wellington: Wellington Regional Council. ISBN 0909016097. OCLC 34915088. ^ "Opahu Stream – Hutt City". Wellington Water. Retrieved 3 June 2016. The Opahu Stream (commonly known as Black Creek) begins near Boulcott Street, meanders through the central city and flows into the Hutt River at Whites Line West. ^ "Hutt City Wards and Suburbs" (PDF). Hutt City Council. Archived from the original (PDF) on 9 February 2013. Retrieved 25 August 2013. ^ a b "Infoshare; Group: Population Estimates – DPE; Table: Estimated Resident Population for Urban Areas, at 30 June (1996+) (Annual-Jun)". Statistics New Zealand. Retrieved 25 January 2016. ^ Tom Hunt and Paul Easton (11 April 2011). "The rise and fall of Avalon". The Dominion Post. Retrieved 1 July 2013. ^ "Contacting the CAA Archived 4 June 2010 at the Wayback Machine." Civil Aviation Authority of New Zealand. Retrieved on 28 September 2010. Carey, Alison (2008). Valleys & Bays – Origins of Street Names in Lower Hutt, including Eastbourne, Petone and Wainuiomata (Paperback)|format= requires |url= (help). Lower Hutt: Lower Hutt Historical Society. ISBN 978-0-473-13604-8. Wikivoyage has a travel guide for Lower Hutt. Wikimedia Commons has media related to Lower Hutt.